Ever since smartwatches were announced (and yes, it was well before Apple announced theirs) I've wanted one. It would have to be waterproof and fitness oriented, though which narrowed down the selection somewhat. 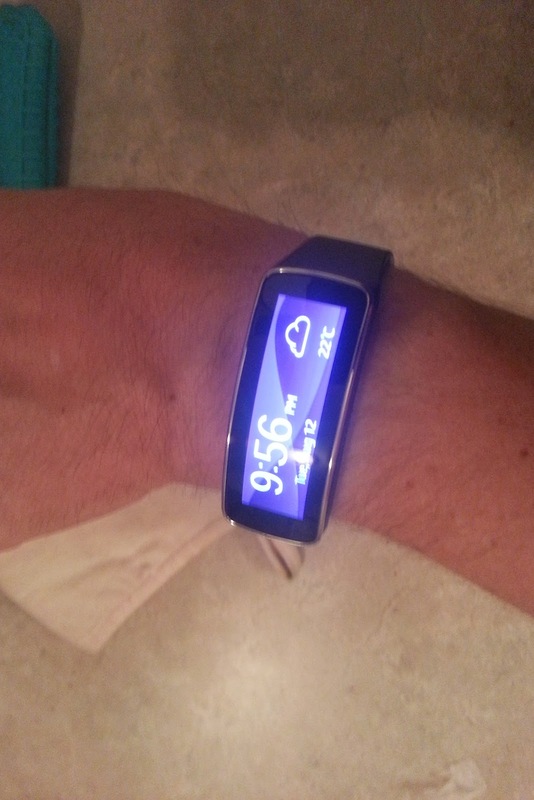 The Samsung Gear Fit would fit the bill (and work well with my phone the Galaxy S3 since they’re made by the same company), and when one went on sale, I couldn't pass it up. Once I got it out of the box, it was quick to pair with the phone. There is a Gear Fit Manager app to download, and the fitness features require a separate app. The first one (from here on, I’ll refer to it as the Manager) let me make some adjustments to the watch’s display and interface. I didn't like the default wallpaper (too colourful) and went with a purple one. The other default I ddidn'tlike was the orientation of the screen for data. It was perpendicular to the way I usually look at a watch. Bluetooth pairing went seamlessly; there was hardly anything to do - the connection can be initiated from the phone's app side or the watch. I think people who struggle with Bluetooth pairing won't have any trouble. As I started using the watch, there were things I liked right away. I loved getting notifications through the watch - I usually keep my phone on vibrate because I don't like it making obtrusive noises, but sometimes I still miss notifications or calls. When your wrist buzzes, it's hard to ignore. You can configure what kinds of notifications get sent to the watch: text messages are probably important, notifications from Google+ communities (for example), maybe not so much. The notifications don't get sent to the watch when you're using the phone, which is a very intelligent feature. The watch has a pretty good range from the phone (I think I got as far as 50 feet from it), so it can be handy to leave the phone somewhere nearby yet safe and secure. Of course, that range gets decreased by walls or obstructions. Beyond the convenience of having an interface to the phone on my wrist, the biggest benefit of the Gear Fit is as a fitness device. There's an accelerometer inside which tracks arm movements and is used to drive the step counter, much like the Fitbit Flex. Unlike the Fitbit, however, you can look at your progress on the Gear Fit's own screen. Making 10,000 steps a day is a great way to keep burning calories throughout the day, and better yet, you have proof of how tiring chasing kids around really is. 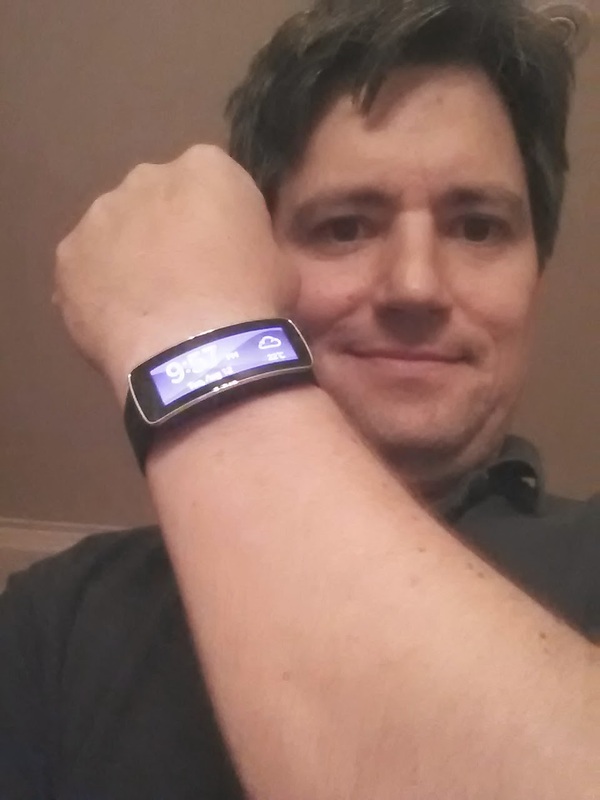 The Gear Fit has a Heart Rate sensor, which I was really excited about. It's worth noting though, that you have to hold still to use it, so you can't track your heart rate continuously while working out. It's better for spot checks like seeing what your resting heart rate is; I tried taking measurements during a run, and even though I stood still it wouldn't get a reading because I was too sweaty or something. The heart rate readings don't interface into third party apps like Endomondo (see below). Heart rate aside, the Gear Fit has its own interface to apps like Endomondo and Strava, so that you can start and stop tracking your mileage through the watch. This is probably my favourite feature, since this kind of thing (starting/stopping, pausing) is always awkward. Now, I put the phone in a Spi-belt (or armband) and don't fiddle with it once I'm out the door. The Gear Fit has an interface to the media player, so that you can start, stop the music (or even video) you may be listening to (or watching) or skip tracks. That's a lot easier than mucking about with the phone that was nicely tucked away in a pocket. I did notice one time that when I used Endomondo to pick my music, there was a serious lag between when I'd hit a control on the smart watch and when the action (e.g. skipping tracks) took place. The accelerometer in the Gear Fit doesn't just track your steps while walking, but you can put the smart watch into sleep mode to track the quality of your sleep, like the Fitbit. The screen makes it easier than the Fitbit to start tracking, but I didn't like how the assessments were presented. It simply gives you a total amount of time, and a percentage that you were motionless. At least Fitbit tried to differentiate (and illustrate the occurrence of) restless sleep vs. waking, even if it got it wrong some of the time. The Gear Fit can be used for alarms, but it doesn't store the alarms locally; the phone must be on and connected (via Bluetooth) to the watch for alarms to work. In my opinion, that makes the alarm feature next to useless. Staying connected to the Gear Fit drains the phone's battery quite aggressively, and the Galaxy S3 didn't have great battery life to begin with. Turning off Bluetooth occasionally (when you didn't need them to be connected) was a good way to save a little battery life. The watch's battery typically lasted about 2.5 days between charging. It charges with the regular charging cable that works for Samsung and Blackberry, but needs an adapter cradle. This cradle is roughly 1 square centimeter and black, so of course, I eventually lost it. I've ordered a new one from Amazon, and I've written this post from notes I've taken during my ownership of the Gear Fit. I'd probably have more details in this review if I was still using the watch (and rest assured, I will again), but I'd really like to get this review finished and move on to other posts. Overall, with smartphones getting bigger and bigger screens, the smartwatch form factor has a lot going for it, and a fitness oriented, waterproof model like the Gear Fit is close to perfect for the tech-savvy, connected fitness enthusiast. What do you think of smartwatches? Cool, or dorky?